In response to overwhelming public demand (that’s you, Josh), here are my thoughts to the recent water landing, called ditching by those of us in the industry, in the Hudson River by a US Air A-320. First of all, let me add my praise to Capt Sullenberger. He did an outstanding job putting the plane down in the river without loss of life, and really without major injuries to almost anyone. A couple of broken legs was all the human cost of an accident that took the total loss of of an airframe. Any accident has a chain of events that lead to the accident. This one was no different. I am not going to go into the the anti-gun, anti-hunting environment we find ourselves in. Because waterfowl, especially large waterfowl like the geese, were so heavily over hunted in the early part of of the 20th century, they were rightly given protection from hunters which were the only effective predators the big birds have now that almost all large, meat eating animals have been eliminated from all populated areas of North America. The subsequent population explosion in goose and to a lesser extent crane populations throughout the US are easy to see. Here where I live, my barber’s father was instrumental in reestablishing the goose population in the area. The birds have gone from 15 animals in the early 40s to many thousands today. We live in central Minnesota, and we are a nesting and transition point in waterfowl migrations. The Canadian geese transit the area on their way north in spring and south in the fall, with other goose species staying here during the summer season, causing my dog to happily chase them from the shoreline and into the lakes. (We try to keep him on a leash when the goslings are too small to evade him. To my knowledge, he has never caught a single wild animal. I’m sure he would starve to death if he had to catch his own food.) Air traffic is sparse, and the airfield is run by folks who know the problems presented by a large goose (and other bird) population. They keep the airfield and its surrounding airspace as clear as they can, and they do a good job of it. Back to the US Air accident. After the bird strike, Capt Sullenberger took the jet and considered his options. Not many of those. He was too low to do anything other than look for a place to land, which he found in the Hudson River. Conditions were ideal for a successful ditching. He was going downriver, so the current was helping lower the difference between the speed of the jet and the water’s surface. There was no wind and therefore no waves, and the jet would have it’s longitudinal axis aligned with its flightpath, all good things. There was not enough time to prep the cabin or even brief the flight attendants about what was about to happen, all bad things. No matter, call over the intercom to brace for impact, and set the plane on the water. Good touchdown, normal to-be-expected hard landing as the engines dug into the water, and a straight run-out on the water. He managed to make the ditching survivable, all one can really expect from a emergency landing. The normal sequence of events for a ditching is for the jet to sink to the wings while the cabin has no or little water in it. The main emergency exits should be the two doors forward and the two doors aft where there are emergency slides, which double as rafts in the water. The overwing exits should not be used, since the jet may sink fairly quickly as the fuselage fills with water. In this case, the jet settled down nose-high, with the aft doors awash. This precluded the use of the aft two rafts, cutting the available flotation to the two rafts forward. In this case, in a river filled with ferries which were able to respond immediately to the crash site, the two aft rafts were not needed. Passengers exited through the overwing exits and lined up on the wings. The jet had only the two forward exits open, so the fuselage did not fill rapidly and the jet stayed afloat until all people had been rescued. Major kudos to the master mariners who so quickly and skillfully deployed their ships and boats to rescue the people from the plane. Their performance reflect great credit on themselves and the city they serve. So a major success. But the aft exit problem is serious. A ditching in the open ocean will have to have all 4 rafts available if all the passengers and crew are to have a chance to survive. I flew many flights over the Caribbean from Miami to Puerto Rico or to northern South America, and if something had happened en route that would have put us into the water I would have needed everything I could get to give everyone alive (assuming I could have done as well as Sully did here in New York.) The crews must be able to deploy all the survival equipment the jet has, or a ditching will have the same situation the Titanic found herself in where there is a choosing of who will live and who must die. We no longer live in a world where that is acceptable. Modern jets do not undergo water landings as a part of their certification process. Models are used to predict the performance of the airframe configuration in the water. Here we have an actual controlled water landing which I’m sure Airbus will look at very closely. They may very well have quite a problem. Was able to talk to my old man, a retired United Airlines pilot, about the water landing in the Hudson river today. He was a pilot on the A320 in his last few years at United. Hopefully I’ll get him to write up his own post, but his thoughts mirrored the old joke about what substantiates a “good landing” (any landing you can walk away from). His observations included the fact the plane had full flaps, which meant the pilot went in as slowly as the plane could go. Also, he mentioned the fact the Airbus people will be very interested in this incident because they don’t have actual data about water landings and how long their airplane will stay afloat. So, considering the pilot “did everything right” this incident will provide data which can be used in the future to save lives. With both engines out, the pilot would have lost his electricity (AC power). Otherwise, the incident wasn’t complicated, the plane took off, hit a bunch of birds, engines went out, the pilot had a few seconds to make a decision and then ditched the plane. In 1929, a man-powered ornithopter designed by Alexander Lippisch flew a distance of 250 to 300 meters after tow launch. The flight duration was necessarily short due to the limitations of human muscle power. Since a tow launch was used, some have questioned whether the aircraft was capable of sustained flight, however brief. Lippisch asserted that the aircraft was actually flying, not making an extended glide. Later tow-launched flights include Bedford Maule (1942), Emil Hartmann (1959), and Vladimir Toporov (1993). All faced similar limitations due to the reliance on human muscle power. In 2005, Yves Rousseau was given the Paul Tissandier Diploma, awarded by the FAI for contributions to the field of aviation. Rousseau attempted his first human-muscle-powered flight with flapping wings in 1995. On 20 April 2006, at his 212th attempt, he succeeded in flying a distance of 64 metres, observed by officials of the Aero Club de France. Unfortunately, on his 213th flight attempt, a gust of wind led to a wing breaking up, causing the pilot to be gravely injured and rendered paraplegic. Seems like a lot of work and pain for something, er, weird. Another incident with a cut rate airline. Hmmm. Stop me if you’ve heard this before. All right. I will not get on my soapbox; I’ll talk about the accident and if I remember I’ll talk about flight safety. Airport first. Back in the ’50s, Midway was the busiest airport in the country. It is built on a section of land in southwestern Chicago and is now surrounded by older homes and commercial buildings. It has not aged well. 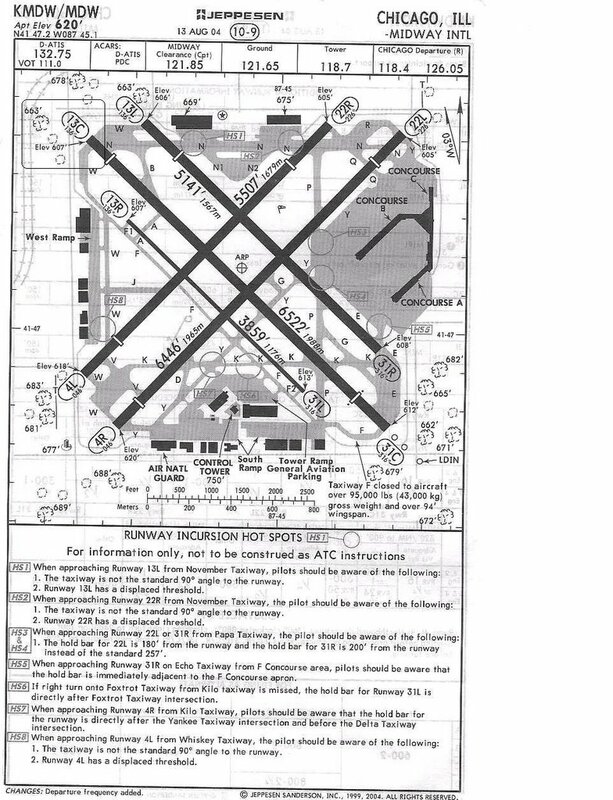 The runways go crossways on the property and are very short for jets, (A square 5280′ on a side has a diagonal of less than 7500′, but the longest runway there is only 6059′ long after the a displaced threshold is taken into account.) None of the runways are certified for automatic landings, so jets have to use much higher weather minimums than a modern airport. The weather was a fairly hard snowstorm with rapid accumulation. When this happens the airport authority will land jets on a runway, pause for plowing, and then resume landings on that runway. 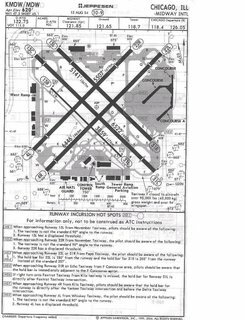 With multiple runways, and Midway has only 2 that are routinely used for transport category jets, most airports can keep landing operations going on at least one runway as they plow the other. This doesn’t work well when the runways intersect, and it is worst when the runways intersect near the centers of the intersecting runways. Midway is the worst case. As the snow accumulates in low temperatures, a couple of things happen. When a jet first touches down, it has no real effect on the runway other than just packing down the snow. Down the runway and near the turnoff point, it is a different story. In older jets, the engines in reverse blow down hot exhust gasses on the packed snow, causing the top layer to melt and refreeze into ice. In all our jets, the brakes get hot and the heat of the brakes and the heat of compression as the tires stop the jet also cause an ice layer to build. So the turnoff point of a runway, especially one that is short to begin with, is normally slicker than first part. A pilot will get a false impression of the stopping power available to him if he just considers his initial brake application. Another factor is the stopping effect of the engine in reverse. You get a lot more slowing power from the engine the faster you are going, so as soon as you touch down you can slow quickly. But when you are about to turn off there is no reverse effect (actually we are trained to come out of reverse at 60 knots or so. If it is slick out I have been known to keep the engines in full reverse all the way off the runway and be grateful for what little slowing I got from them, because the brakes weren’t giving me much at all.) So the longer it has been since the runway has been plowed, the slicker it is, and the more pilots can be suprised by just how little effect the brakes have at the turn-off point. Now the airline. Southwest, long a darling of Wall Street, is well known to offer flights at extremely low costs. In the aviation community, they have also been known as an airline who is willing to cut corners. They have only one type of jet, and require their applicants for pilot jobs to already be qualified in that type. Because of this, their training costs are very low. As new cockpit aids became available, Southwest did not buy them until Boeing no longer offered the older navigational aids in their new jets. Their pilots are well known to taxi faster than other airlines, and they are agressive in requesting short cuts in the air. (So was I.) They had an incident at Burbank, California, a few years ago when one of their pilots, high and fast on final, refused to go around, landed long and hot and slid off the runway, out of the airport property, and into a gas station across the street. There was a night when all the United jets had to execute automatic landings at Los Angeles and noticed that all the Southwest jets were also landing, even though they did not have automatic landing systems which were, as far as we knew, the only system with low enough minimums to even start the approaches. This went on until a United pilot asked LA approach about it, and all of a sudden the SWA jets started to divert. Southwest also ran a jet off the end of the runway at Teertobourogh, New Jersey a couple of years ago. All airlines are mostly safe. Making the airline as safe as you can is expensive, and it is an expense that I am not sure Southwest has been willing to pay. And you get what you pay for. If you fly Southwest, that is why your ticket is cheaper. Are you worth it? For the first time since the program was reinvorigated after 9-11, a US Air Marshall has fired a weapon in defense of an aircraft. Unfortunately, it seems that the guy they killed was not armed with a bomb, the way he said he was. He was just a guy with bipolar disease who was in the midst of the action side of the affliction. Still, it is easy to see why the Marshalls saw him as a threat. After all, he said he had a bomb in his carry-on, and he was reaching into that bag after being told to halt and surrender. It was a fatal move. American city to Miami takes about 4 or 5 hours, so it was not an extremely long flight. The pax had started from Quito, Equador, so he had been travelling all night when the incident occurred. This may have had something to do with his reaction in Miami.